This mix has been a wonderful addition to our bread oil dip line. We have received rave reviews from our customers. Bruschetta mix is so delicious that our customers do not want to leave our sampling booth. Ideal for bread dipping or applying to toasted bread. It's very easy. Just add 3-4 tablespoons of water to the package mix and let sit for 5 minutes to properly absorb. Mix well. We like to add 1/4 cup olive oil but its a matter of taste so add to your liking. Apply a thin layer to toasted bread (Tuscan is great) and sprinkle some romano or parmesan cheese on the bread. This is so good and difficult not to eat it all. Customers also enjoy Bruschetta mix with diced tomato and sliced onion. Use Bruschetta mix in this manner as a seasoning. Makes (4-5 pieces). Recipe: one medium diced tomato, 3-4 slices diced red onion, 1/4 cup red wine vinegar, 1/4 cup olive oil, 1/2 package of softened Bruschetta mix. Mix all ingredients, let sit and spoon on your favorite toasted bread. We have some customers that rave about the taste of Garlic Butter and Bruschetta mixed together for a sensational taste. 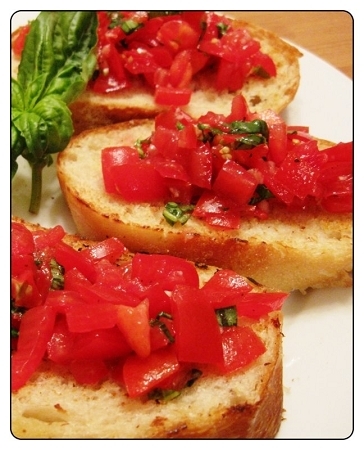 We recommend 2 tablespoons Bruschetta mix to 1 tablespoon Garlic Butter. Add in 3 tablespoons of water to absorb. Mix well. Add 1/2 to 3/4 cups olive oil. Apply to English muffins rolls, top with cheese, (meat optional) and toast in oven for Garlic Bruschetta Pizza. This is so good it's scary. The Bruschetta mix can also be used as a savory dip mix. Just add one cup of sour cream and one cup of mayo, mix well and refrigerate for a minimum of one hour. Enjoy and "Mangia "(eat well) in Italian.